Anise Hyssop Snow Spike Agastache Foeniculum is a wonderfully fragrant, perennial herb plant. Also known as Licorice Mint, this fantastic flowering herb can be easily established from Agastache Foeniculum seeds. 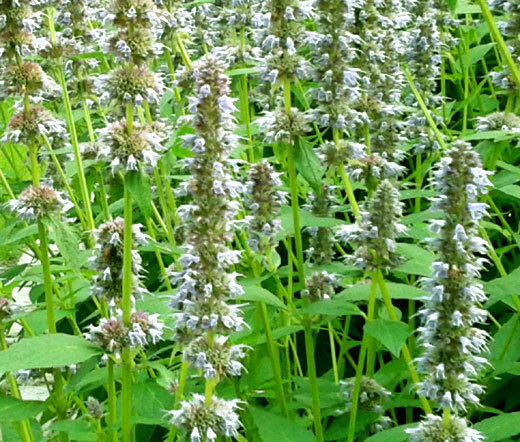 Anise Hyssop Snow Spike produces tall flower spikes that are full of small, white flowers. The flowers are mint scented and they appear in scattered locations along the flower spikes for about one or two months from mid to late summer attracting myriads of bees, hummingbirds and butterflies. Anise Hyssop Snow Spike is an excellent plant for borders, mass planting, and for herb gardens. Agastache Foeniculum prefers to grow in full sun to partial shade tolerating the soil that is consist of loam, clay-loam, or contains some rocky material. Licorice Mint makes a good cut flower and can be used in various floral arrangements.